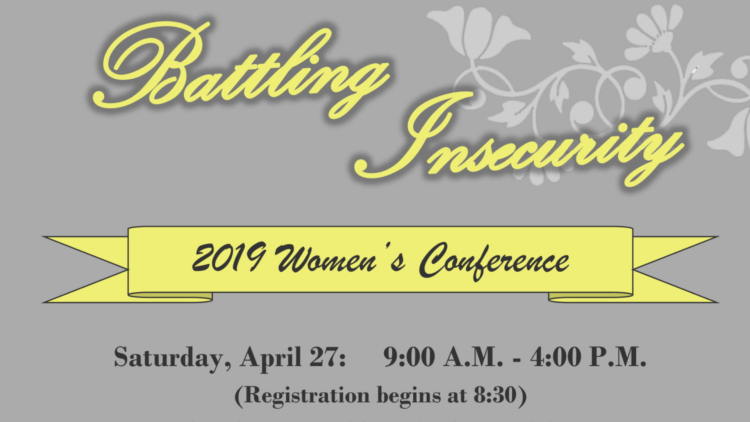 Saturday April 27th, 2019, from 9:00 a.m. to 4:00 p.m., women from 7th grade and up are invited to come join us for Battling Insecurity, a women’s conference. We will be learning how to combat insecurity and to find our security in Christ. There will be a keynote speaker, break out sessions, and a multigenerational singleness, marriage and dating panel. This will be an encouraging time of learning and fellowship for Christian women in central Nebraska. The conference will be located at the Heartland Evangelical Church in Central City, NE. Tickets cost $16 and include a catered lunch by Medina Street Vault of Cairo, NE. Purchase tickets at http://bit.ly/battlinginsecurity. Groups of 10 or more can receive group rates by calling Nebraska Christian Schools at 308-946-3836. This conference is put on by A Woman’s Perspective: Advanced Christian Literature class at Nebraska Christian Schools. If you have questions, you can call Miss Kaity Flynn at 308-750-0117 or email kflynn@nebraskachristian.org.